Photo, Youth participating in the Institute for Community Leadership programming show King County Councilmember Dave Upthegrove stream restoration work in Kent. The King County Council passed a supplemental omnibus budget last week that included a $5,000 grant for the Kent-based Institute for Community Leadership to continue environmental education and stream restoration work. “The Institute for Community Leadership is an outstanding organization that not only restores fish and wildlife habitat, but also inspires the next generation of environmental stewards and leaders to have an eye towards social justice,” said budget Chair Dave Upthegrove, whose District 5 includes Kent. 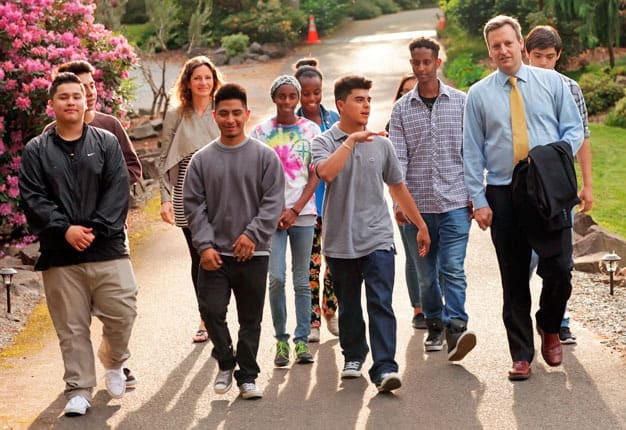 The group partners with schools in South King County to carry out classes and civic engagement projects focused on social and environmental justice. The group maintains the O’Dell Education Center in Kent and collaborates with South County environmental organizations including the Friends of Soos Creek and the Green River Coalition in environmental restoration and classes that focus on water quality and the health and wellbeing of the streams and rivers that flow into Puget Sound.